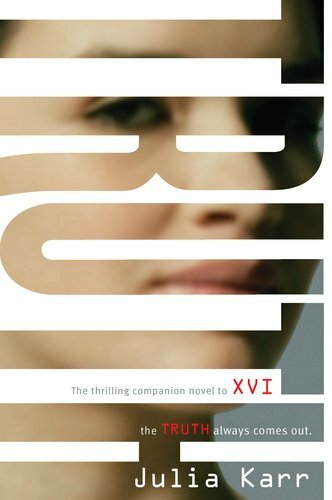 In this sequel to "XVI" we get set right back into the lives of Nina, her sister Dee and all of her friends. I was a fan of the first book, but I really felt like the story moved along in this one. We get a lot more information about the Resistance and what the different branches of it are really doing. Some pretty terrible things happen with Nina's family in the beginning of the book and I think those served as some great motivators for her to get more involved. She joins up with a group of girls working on the Resistance and they work together to help get the word out about the horrible truths behind the GC and what the FeLS is really up to. We don't really see a lot of Sal in this book. He's off doing NonCon work a lot of the book, but when he was around I often found myself wishing he would disappear again. I wasn't a huge Sal fan in the first book, but I'm really over him in this one. His work for the Resistance is very obviously more important to him than Nina is, and when he is around her he is so pigheaded about her ability to look out for herself. I often felt like he didn't care so much about Nina, but about being the hero that made sure she was always safe. We do get a new love interest in this book and even though he doesn't want anything bad to happen to her, he also knows she is capable of taking care of herself. He believes in her. I am most definitely on his team. I also really like that we get to see a lot more of Dee in this book and she gets to learn more about what is really going on around her. She's definitely not a naive little girl, and I think if she's given the chance in the next book she will be able to prove how strong she really is. The endind set up some great stuff for the next book in the series. I'm really curious about how it will all come together and what will happen to the GC once the Resistance gets all of their information out there. This was a great second book and I enjoyed it even more than the first. I really look forward to reading how Nina's story is going to end. I can't wait to read this one! I really enjoyed XVI. Great review!